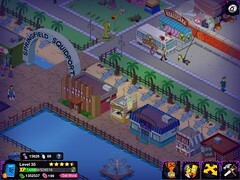 If you purchased the Film Set for 120 donuts you will unlock the McBain costume for Wolfcastle, as well as this six-part quest. Any tasks completed while wearing the McBain costume earn money and XP at the premium rate. Interesting side-note, did you know that if you pieced together all of the McBain clips from the various episodes of The Simpsons that they would actually fit together as one flowing narrative? The focus of this update was the character Rainier Wolfcastle, who is essentially a parody of the actor Arnold Schwarzenegger. Thankfully this story line involved several characters in Springfield, making it a bit more engaging than some other quests. Still though, Wolfcastle is a fairly minor player as far as characters go. If you’re looking to get bit more out of this character, for 120 donuts you can purchase the Film Set which unlocks the McBain costume. Hopefully they will do more with the character in the future. How cool would it be for him to get a Radioactive Man costume, and for Milhouse to get a Fallout Boy costume?